Each member and team has their own 'Transactions' area within their Membership record, where administrators can manage all purchases and payment information. Transactional information is automatically added to member/team records each time a member or team uses the online Registration Form. For example, if Joe Smith registers through his club's online registration form for the 2015 season, a transaction will automatically be added to the Transactions area of his member record if the product is mandatory. The transaction will include the product purchased (eg. 2015 senior player registration fee), quantity purchased, cost of the transaction, and payment information. A transaction is also created if a member uses the online Registration Form to purchase any other products, e.g. merchandise or tickets to the club's presentation dinner. Association and club administrators can view and edit any transactional/ payment information for their members, and run reports on transactional information. 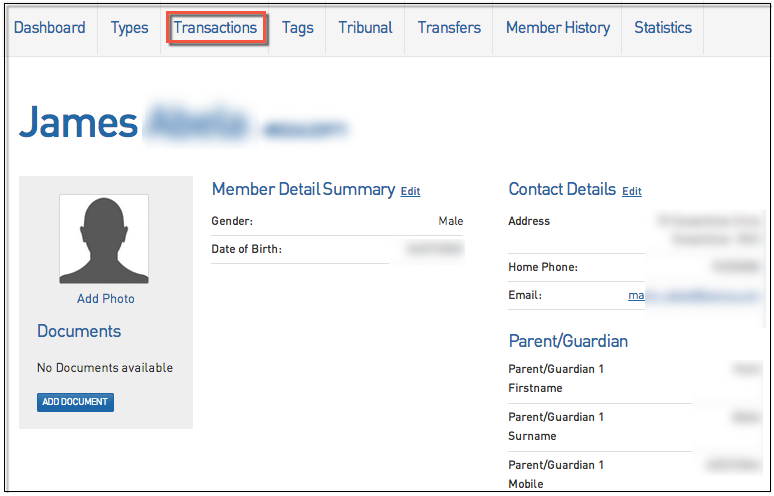 Transaction details can also be entered manually if the online registration form is not being used.